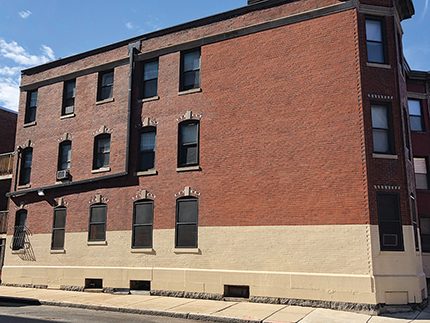 Boston, MA Abbot Building Restoration Co. completed a maintenance project on the left elevation of a 3-story brick and stone college dormitory building owned by Wentworth Institute of Technology (WIT) at 60 Louis Prang St. Abbot was awarded the project based on its previous experience with WIT on a larger dormitory project in the same city block in 2016. WIT contacted Abbot to perform an investigation and develop a repair plan. Abbot found that the brick joints were severely eroded and the wall had some deteriorated brick to replace. Additionally, the wood window trim was severely deteriorated and needed repairs. Abbot erected scaffolding alongside the building, then cut and pointed all of the brick joints, and replaced multiple damaged bricks and rotted wood trim. To complete the project, Abbot replaced two cracked stone windowsills with new matching pre-cast stone sills, and recaulked and painted the new wood on all of the windows.